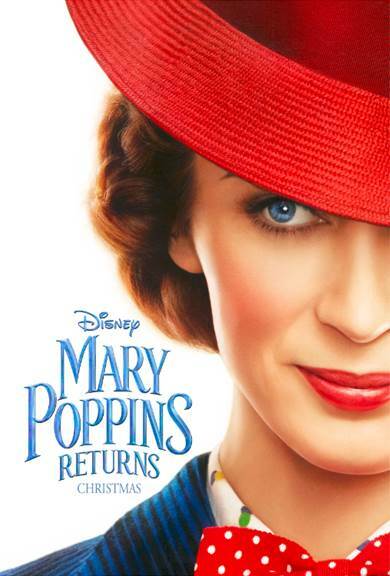 MARY POPPINS RETURNS stars Emily Blunt as the practically-perfect nanny with unique magical skills who can turn any task into an unforgettable, fantastic adventure; Lin-Manuel Miranda as her friend Jack, an optimistic street lamplighter who helps bring light—and life—to the streets of London; Ben Whishaw as Michael Banks; Emily Mortimer as Jane Banks; and Julie Walters as the Banks’ housekeeper Ellen; with Colin Firth as Fidelity Fiduciary Bank’s William Weatherall Wilkins; and Meryl Streep as Mary’s eccentric cousin, Topsy. What's your favorite song or scene from the original Mary Poppins movie? Be sure to tell me in the comments!